Grove Press, Black Cat, 9780802122377, 363pp. 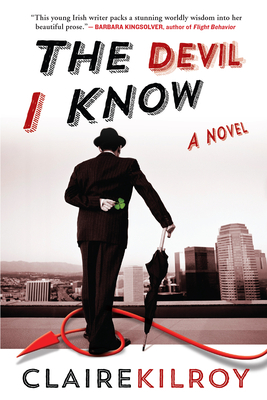 In The Devil I Know, award-winning writer Claire Kilroy delivers a delicious novel, a cautionary tale of financial excess set during the Irish property bubble. Tristram St. Lawrence has not been home for years--ever since he missed his mother's deathbed in favor of going on a bender, the thirteenth Earl of Howth is not welcome in the family castle. Now sober, he lives in self-imposed exile, and his main confidant is his sponsor, a mysterious businessman known only as M. Deauville. One day, when his plane is unexpectedly diverted to Dublin, Tristram ends up where he started, and an old acquaintance, a bully from his school days who's now making a name in construction, pitches to Tristram an ambitious development project. The trouble is, M. Deauville thinks it's a good idea, and before Tristram knows it he's settled in Howth under his father's baleful gaze and is up to his neck in funding proposals, zoning approvals, and the personal life of his business partner. A wry and timely skewering of a country, a man, and an entire international financial system descended into madness, The Devil I Know establishes Claire Kilroy as a vigorous and wonderful new talent.